St Winwaloe’s Church, Poundstock, stands in a sheltered valley above a small stream, half a mile from an ancient holy well and a mile from the sea. Poundstock was dedicated to St Winwaloe by 1333, but this was later forgotten and St Neot claimed as patron till the 1970s. The existing building originally consisted of a Norman chancel and slightly wider nave with transepts added in the fourteenth century. Only the southern transept survives as the northern was demolished when the north aisle, known as the Penfound aisle, was built. (A monument on the north wall of the Lady Chapel, dated 1638, bears the arms of the Penfound family). The date 1423, often attributed to this part of the church, actually refers to a licence for a chapel at Penfound in the parish. Work may have been done on the church at this time – the narrowness of the north aisle and the two simpler octagonal granite piers are suggestive. The arcade of four lofty arches and mullion windows are more typical of 1500. There is also a south porch and unbuttressed tower. The square granite font, is probably Norman, c.1200 as are the portions of a Norman pillar-piscina nearby. There is also a rectangular stone coffin-slab inscribed with a cross of possible thirteenth century date, discovered in 1896 in use as a windowsill and an ancient grain domestic measure. Two surviving fragments of stained glass are early sixteenth century. One in the south transept shows a castellated canopy, the other in the Lady Chapel contains an ox, the emblem of St Luke suggesting that all four evangelists were once represented here. Following further gradual decay during the latter years of the of the nineteenth century, legal permission was grated for substantial restoration and re-ordering in 1891, though the work was not undertaken for five years, when the architect Mr G Fellowes Prynne began restoring the church in 1896. The old rood screen was removed in 1903– its stairway still exists in the angle between chancel and transept – and some elements were fashioned into the present choir stalls. The interior restoration was continued by Mr E. Sedding and Mr Stallybrass with 1917 carving by Miss Rashleigh Pinwill. The most interesting fragment comprises painted panels, expertly restored in 1982 and mounted in the north aisle, showing figures of saints: Philip, Bartholomew, Jude, Blaise, possibly Helena, Sitha (Zita), St John the Baptist and Apollonia. During the restoration two large early sixteenth century wall paintings were discovered under layers of limewash above the north door. They show the Tree of the Seven Deadly Sins and the Warning to Sabbath-Breakers with the lower half of St Michael weighing souls and Virgin Mary as protectoress over the door between. The church is set away from the main centres of habitation but there is some evidence of nearby medieval housing. At the edge of the churchyard is the Grade I listed Tudor Gildhouse, the finest example in Cornwall of a church house. It was built, or re-roofed, in the 1540s to raise funds for church maintenance. Here, parish feasts were prepared and held, with profits going to the church. Today it fulfils much the same function. 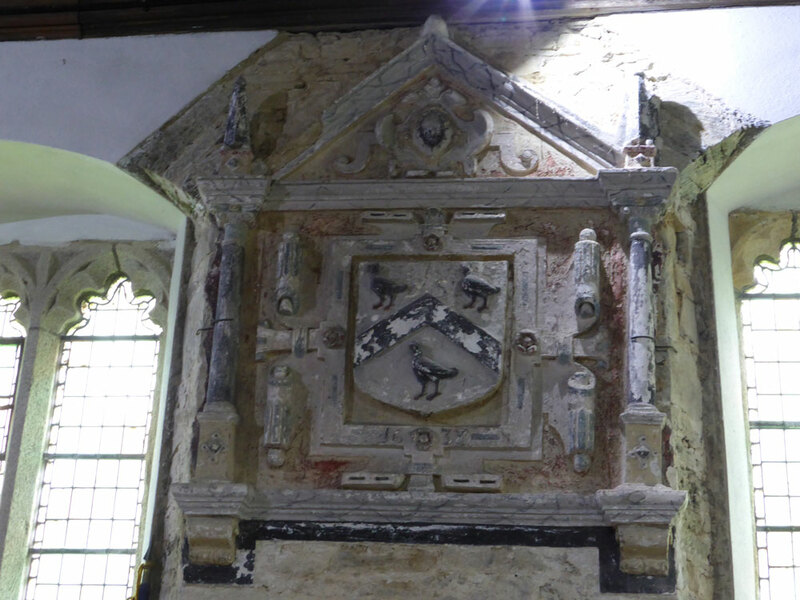 The 1638 plaster royal coat of arms, which now dominates the south end of the feasting hall, was moved from the church in the 1970s.